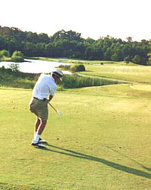 North Carolina is known for fantastic golfing and the Wilmington area has no shortage of great courses to play. There are more than 50 courses within about an hour's drive. Below is a list of some of the better courses in and near Wilmington. If you play a lot of golf, you should check out the discounts you get by being a member of Golfcard International. You can get discounts on some of the courses below by joining. You can find out more about Golfcard International by clicking here. As a member you get discounts at over 3,800 courses throughout the country.